Tim Robinson also gives the alternative name Binn an Choire Mhóir, 'peak of the big corrie'. The sappers set up a beacon on this peak during the first Ordnance Survey [TR]. 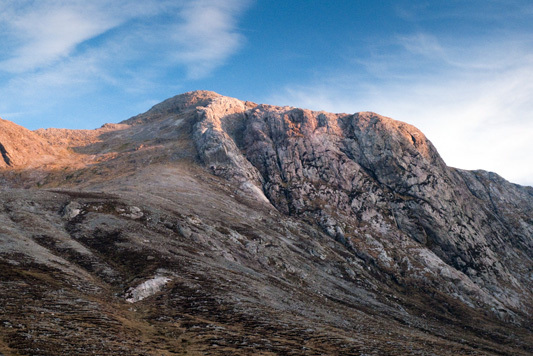 Binn Chorr is the second highest mountain in the Twelve Bens area and the 105th highest in Ireland. 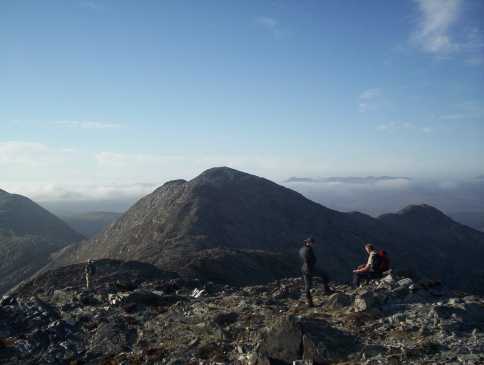 Binn Chorr is the second highest point in county Galway. From the summit of Binn an tSaighdiúra we picked our way carefully south down over loose rock towards Mám na bhFonsai. From this wild, rocky col between Binn an tSaighdiúra and Bencollaghduff the views eastwards towards the Maumturks with the outstretched arms of Bencorrbeg and Bencorr embracing the corrie that is the Corrabeg Valley are particularly fine. From Mám na bhFonsai a steep, rocky ascent over a faint zig-zag pathway leads to Bencorr’s North Top that offers amazing views southwards to Derryclare, Loch Bhaile na nInse and on to Roundstone Bog. From here we continued along the ridge which traverses thick bands of brilliant white quartz and inclined slabs of rock involving some scrambling up and down which would certainly pose a challenging walk in adverse weather conditions. 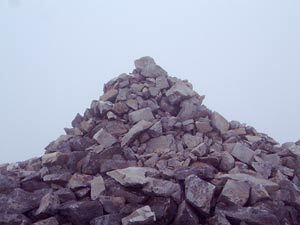 A short and enjoyable scramble then leads to the summit cairn on Bencorr. From here we savoured the broad sweep of the ridge we had traversed from Binn an tSaighdiúra and views of the majestic Twelve Bens marching away to the NW, each peak growing ever fainter in the purple haze of the late afternoon. Superlatives utterly fail me. Connemara is a wild, elemental place that truly excites and ignites the senses. By now it was early evening and mindful of time we decided to make our way back to the Gleninagh Valley and there are no quick and easy routes off this ridge. Mám na bhFonsai marks a low point beneath which vertical quartzite cliffs fall away in dramatic fashion. Although there is a potential route down to the valley at L804 529 A it would be foolhardy for the inexperienced to use this as an escape route or during inclement weather. We chose another route which should also not be attempted in adverse weather or darkness. Retracing our route along the ridge we descended Bencorr North Top then traversed round the steep slopes of Binn an tSaighdiúra to the top of the gully L81086 52969 B that leads down towards Carrot Ridge. Passing across the top of this we continued along a well defined traverse path over the top of the scree slope to the east of Carrot Ridge. There is not even the faintest of sheep tracks down over here and although a rope is not necessary, the descent is tortuous on the knees due to steep unstable ground comprised of unconsolidated scree and patches of peat loosened by the recent snow and subsequent thaw. With great care we made steady progress in the shadows of the rocky spine of Carrot Ridge which we had climbed earlier that day, the top of which was now tinted with the rosy glow of the early evening sun. The mountain is also known as Bencorr. This summit was an important point in the principal triangulation of Ireland. Rays from it were measured to Keeper Hill, Slieve More, Brandon, Baurtregaum, Nephin, Slieve League etc in 1830. It would be interesting to see if any of these places can still be seen on a clear day. The distances are: Keeper Hill 132.60km, Brandon 145.04 and Slieve League 145.89.